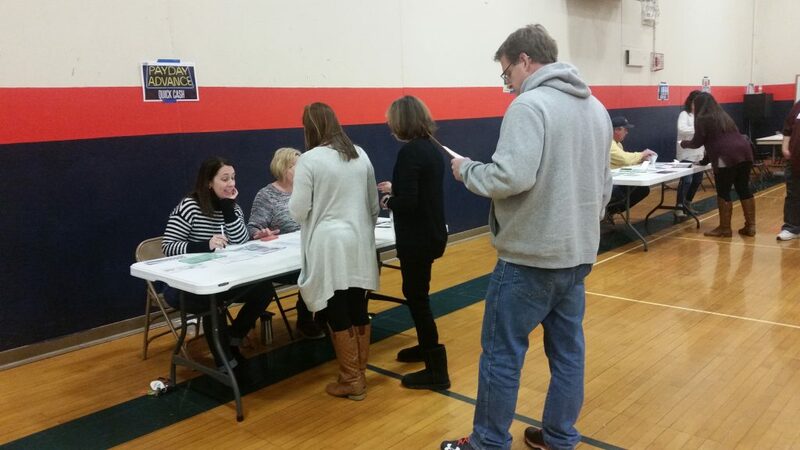 The event — a professional development training hosted at the Mahomet-Seymour Junior High School — was a poverty simulation. The staff spent most of the morning darting across the gym between small circles of fold-out chairs that served as the participants’ pretend homes. The staff wore name tags denoting the characters they had been assigned to play — a racially diverse group of family scenarios that included a range of ages from grandparents to toddlers. Some staff members were laughing. A middle-aged white man walked around the gymnasium with a black baby-doll strapped to his chest. He was playing the role of a single black mother in her teens. The Mahomet-Seymour district serves a student population that’s about 90 percent white, and a community with a median income close to $100,000. Nicole Rummel, director of instruction at Mahomet-Seymour, says the purpose of the simulation is to sensitize the staff to the challenges students and their families in poverty face. She estimated that about 20 percent of the district’s students qualify for free or reduced lunch and that the number has increased in the past decade. Staff taking part in the simulation were tasked with making ends meet on extremely limited means over the course of four simulated weeks that in reality encompassed about two hours. Participants had to pay their rent, utilities, grocery bills, keep a job, get their children to school and avoid jail for stealing or dealing drugs. Natalie Back, a 7th grade history teacher, was sitting by herself when I approached her. “I just got robbed by a drug lord,” she told me. “They’re pushing me to sell their drugs. I told them no and they’re threatening my family and they took my social security card.” Back was in character as a 52-year-old Latino man named Anthony. Anthony is on disability, he’s diabetic, his wife works full-time as a cashier, he has a 9-year-old granddaughter and their 7-year-old grandson “just moved in with us because my daughter was incarcerated for drugs and their father was never in the picture,” Back told me. At one point during the simulation, Back told me, “I found a way to make money, but it’s putting our family in danger by selling drugs.” She said a woman had manipulated her into selling the drugs and had threatened to call the cops on her family if she stopped. While the simulation may not feel like a game to Back, it certainly looked like one to Susan Roll the first time she tried it. Roll is a social work professor at California State University in Chico. She and a colleague had applied for a small grant to pay for a poverty simulation kit. The kits are sold by the nonprofit Missouri Community Action Network for about $2,100 and each kit includes some 22,000 pieces. Roll said the kit arrived “in this giant box” and they facilitated the simulation without doing much research beforehand. Roll described that first experience using the simulation with her undergraduate students as disconcerting. “We were standing there and we were watching this go down and we thought people are playing poverty. Like this doesn’t feel right. And students were sort of silly about it and laughing and oh isn’t this funny and oh I beat you and I have more money than you and oh there’s the drug lord and he might try to steal from you. It felt very uncomfortable,” she said. Inspired by their discomfort, Roll says she and her colleague, Laurie Browne set out to study the simulation’s long-term effectiveness. The study, titled “Toward a More Just Approach to Poverty Simulations,” concluded that without the right context and critical thinking applied to the simulation experience, it might actually cause more harm than good. Mary Bifulco manages the poverty simulation program for the Missouri Community Action Network (MCAN). She says the simulation was created by a group in St. Louis called the Reform Organization for Welfare (ROWEL). The group’s intent was to use the simulation as a lobbying tool for legislative and administrative changes to the welfare system, she said. MCAN purchased the rights to the simulation in 2002 and adapted the scenarios to reflect the range of families living in poverty in Missouri. “Our mission is to use the poverty simulation to sensitize people of many walks to life to the day-to-day realities people in poverty face,” Bifulco says. The agency has sold about 1,400 kits to universities, school districts, social service organizations and a few utility companies across the country and abroad, she says. The demand for the kits has significantly increased in the last decade, according to Bifulco. MCAN strongly recommends simulation facilitators undergo training that the organization offers. Bifulco admits the simulation isn’t a cure-all nor is it perfect. “When we’re selling these kits, there’s not a lot of quality control from MCAN necessarily,” she says. Bifulco says that without the right facilitator or critical thinking applied to the event, the simulation could potentially reinforce false assumptions about poverty and the people who experience it instead of fulfilling its intended purpose, which is to break down those stereotypes and drive civic action to end poverty. Take Natalie Back for example, the school teacher from Mahomet, and her experience selling drugs in the simulation. Kim Senor, a Springfield Public Schools employee, is certainly aware of the pitfalls. She’s both participated in and facilitated the poverty simulation in Springfield Public Schools, a district located about an hour west of Mahomet. Springfield’s median income is about half that of Mahomet’s, and the school district is more racially diverse. Senor is a parent educator and she serves as a liaison between families in that community and the school district. The first time she participated in the simulation, Senor says she passed out. That’s because, she says, it reminded her of when she lived in poverty. At the time, she moved to Chicago from Springfield to get away from an abusive marriage. She lived in a one-bedroom apartment with her son, who slept on the floor, and her daughter, who shared a bed with her. Senor says the simulation helped her contextualize her own experience. “That’s what I saw. They really don’t know. They just figured out a piece of it. But it didn’t offer any empathy or sympathy toward any families. It was just like, ‘if we can figure it out in three hours surely somebody who has been in it for years and years can figure it out,’ which is not the case,” she said. Roll, the social work professor at California State University, says the simulation is an effective tool to build empathy so long as it’s employed properly. If it’s not contextualized correctly, “it does look like this game, we’re playing this game and those are people that I don’t know and oh, it’s too bad for them, and why don’t I put a check in the mail to the food bank and not get my hands dirty. And that’s where I think the problem is,” she says. She says she now uses other strategies to get her students engaged with poverty, including getting out of the classroom and into the their local community. Senor thinks that approach could work for school teachers, too. “Without a shadow of a doubt we need more teachers going out and doing home visits and actually seeing what’s going on,” she said.